At least 10 civilians,including three children, have been killed in the eastern regions of Ukraine in the 24 hours since a peace deal was signed in Minsk that envisages a ceasefire on Sunday.The OSCE reported the use of cluster munitions. Kiev will call for an emergency European Council meeting if the ceasefire is not implemented Sunday, Ukrainian President Petro Poroshenko said Friday. He announced this at talks with Hungarian Prime Minister Victor Orban. The Minsk peace deal “offers a way forward to comprehensive, sustainable and peaceful" resolution of Ukraine crisis, G7 leaders said in a statement, issued by the French presidency on Friday. It added that the group is ready to adopt "appropriate measures" against those who violate the peace accord. Three children and one adult have been killed during the shelling of the Donbass town of Gorlovka, three civilians have died in Donetsk, and at least 15 people have been wounded in the daytime after the new agreement was reached in Minsk, a Donetsk militia representative told reporters. “Yesterday during the shelling in a private house in Gorlovka three children died – a one-year-old boy and girls aged six and 12,” Eduard Basurin said Friday. According to the Ukrainian Interior Ministry, during the same period three civilians were killed and 11 were wounded in shelling by Donetsk self-defense forces, RIA Novosti reported. Loud artillery volleys and explosions were heard in northern Donetsk on Friday morning. 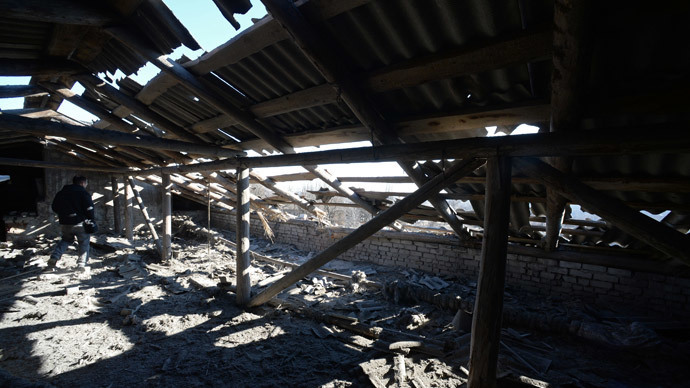 A shell hit the territory of a local kindergarten and a woman was wounded, but no children were inside the building. In the neighboring Lugansk region, two men and a woman were killed and four people were wounded Friday night, RIA Novosti reported. Another four people died and five people were wounded in the shelling in the town of Schastye blamed on the self-defense forces by the Kiev-appointed authorities, according to Interfax. The local Emergencies Ministry called for people not to leave shelters and homes, especially in the nighttime, due to the increasing rate of the shellfire. The Organization for Security and Co-operation in Europe (OSCE)’s report Friday said that cluster munitions were used in Thursday’s shelling of the city of Lugansk. “The damage to the buildings (broken windows, roofs, fences) was estimated by the SMM, based on the small size of the shrapnel and the high number of impacts on the wall, to have been caused by explosions of bomblets from cluster munitions,” the report said. The shelling came from the northwest, it added. The blame game also continues. According to the Defense Ministry of the Donetsk People's Republic, there have been 42 cases of firing in the last 24 hours from Kiev’s side. In their turn, the Ukrainian military said that they were only returning fire, as self-defense forces fired over 40 times during the last night. Eight Ukrainian soldiers have died and over 30 have been wounded since Thursday morning, according to General Staff spokesman Vladislav Seleznev, Interfax reported Friday. Russia’s permanent representative to the OSCE, Andrey Kelin, said that the number of the organization’s monitors will be increased from 230 to 350 on Saturday. “The work has commenced nearly immediately to fulfill the most urgent points [of the agreement],” he said Friday. OSCE monitors said in a separate statement they would ask for safe and unlimited access to all regions in eastern Ukraine, including those bordering Russia. With the international community closely watching recent developments in eastern Ukraine, as well as anticipating Sunday’s ceasefire, a not-so-surprising split in attitudes prevails in the country, divided by the conflict. While according to the authorities of the Donetsk People’s Republic, “It is the first and a very real step towards putting an end to war,” President Poroshenko is quite skeptical. During a Friday visit to a military training ground, he said: “I don't want anyone to have any illusions and so I am not seen as a naive person: we are still a very long way from peace,” as cited by Reuters. “Nobody has a strong belief that the peace conditions which were signed in Minsk will be implemented strictly,” Poroshenko said. His comments were echoed by Ukrainian Foreign Minister Pavel Klimkin, who told Friday’s session of the Ukrainian parliament: “Now we are working on the constant control over each point [of the agreement],” adding that he doesn’t rule out the possibility of “backsliding” on the agreement. The deal was signed after 16 hours of talks from Wednesday to Thursday by the so-called “contact group” – the leaders of the self-proclaimed Donetsk and Lugansk People’s Republics, a representative of the OSCE, Ukraine’s former president Leonid Kuchma, and the Russian ambassador to Ukraine. A separate declaration supporting the agreement was agreed upon by the so-called “Normandy 4” leaders – French President Francois Hollande, German Chancellor Angela Merkel, Russian President Vladimir Putin and Ukrainian President Petro Poroshenko. To secure an end to the bloody and devastating internal conflict that broke out in eastern Ukraine last April, which has already taken the lives of over 5,300 people, according to the UN, the Minsk agreement provides for a security zone separating the warring parties. A heavy weapons pullout is scheduled to start on Sunday together with the ceasefire, and should be completed in no more than 14 days. The OSCE is charged with implementing the ceasefire on the ground and is expected to use its drone fleet and monitors to verify that both Kiev and the self-proclaimed republics are sticking to the deal.